inRoute 6.0 is now available, with custom pin colors, a drawing mode for editing multiple pins, iOS 11 features including an improved pin style, iPad enhancements and much more. Tap the new Draw icon on the map and select multiple map pins by drawing around them with your finger. Then set their color, add them to a route, save or clear them. Split-view and external keyboard shortcuts to search, edit, and save (hold the command key to show available commands in varying contexts). 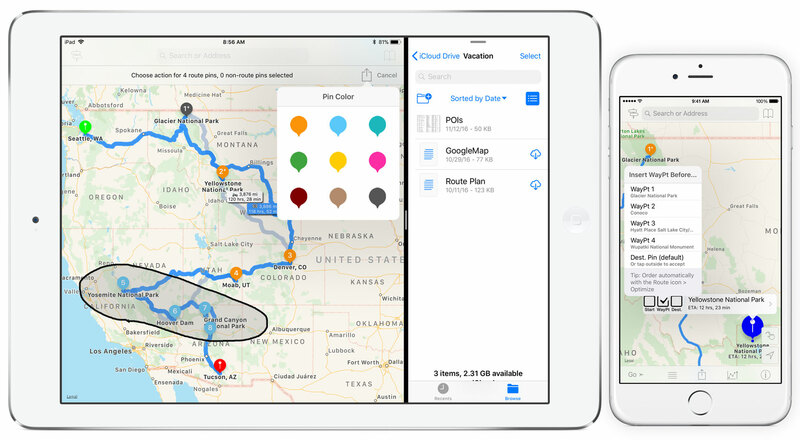 – iPad drag-and-drop: Drop a pin from the Maps app or Contacts; import files (XLSX, GPX, KML) by dragging them from the Files app and Mail; drop a text list of addresses to create an optimized route.